William White was a photographer in Edinburgh (1880-83). 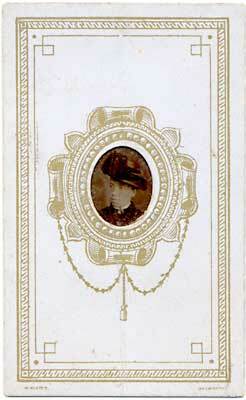 - Gem portraits, which he also described as Tinplate American Portraits. 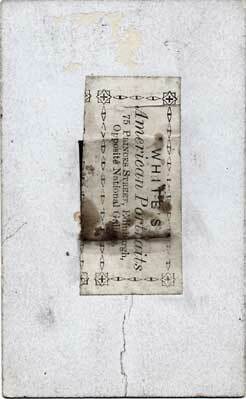 These were very small prints, in cut-out ovals on green card, the whole card being carte de visite size. Below are the front and back of a White's Gem Portrait. The small tintype photo has been stuck to the back of the cardboard mount with the label advertising White's American Portraits, 75 Princes Street, opposite National Gallery. The rust from the back of the tintype can be seen through the label. The only other gem photographs that I have seen from named studios in Edinburgh were by J Austin's American Gem Studios. They were based at the same address, 75 Princes Street (but when?). Was William White of Edinburgh the same photographer as William White who had three studios in Glasgow (1861-84)?